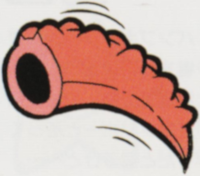 A Pikku is a leech-like enemy that appears in Super Mario Land 2: 6 Golden Coins and is found only in the last stage of the Pumpkin Zone, where the witch is fought. There are only two Pikku found in the level. The Pikku simply hop back and forth, getting in the way of Mario. It can be defeated with a single stomp. This page was last edited on February 6, 2019, at 14:28.